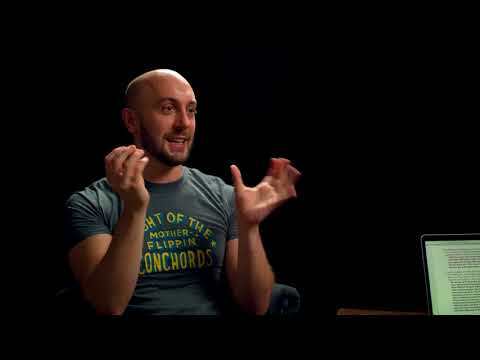 I have been trying to figure out how to best light podcasts and interviews where both the interviewee and interviewer are on camera but seems like all tutorials and course assume the interviewer will never be seen or that you can switch lighting and angles to catch either side of a conversation. My question is how do I get something like the image above set up with two people in the scene and no inclusion of cameras and lights in any of the 3 shots? Are they both behind the desk? I see camera A and B yet you speak of 3 shots. Will cameras be shooting over shoulder? This diagram shows a news reader style set up. 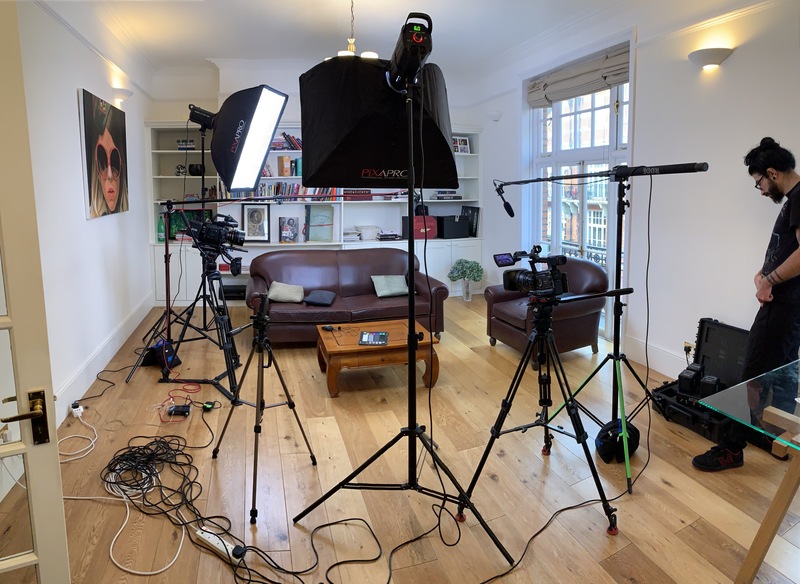 Interview situations usually shoot over shoulder with 2 cameras(1 camera on each subject) and a third shooting a 2 shot(positioned downstage center) either stationary or on slider/dolly. IMO your diagram and question do not match. Provide a visualization of the scene as you see it. 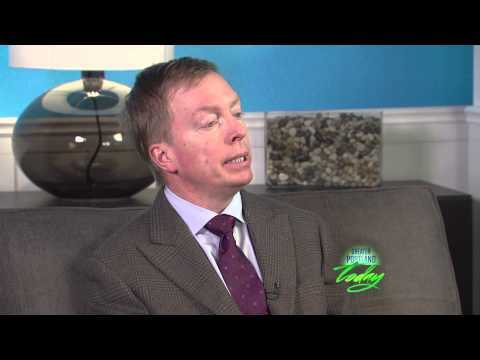 Do you want a White House style interview look, a Charlie Rose look or EPK(electronic press kit) look. 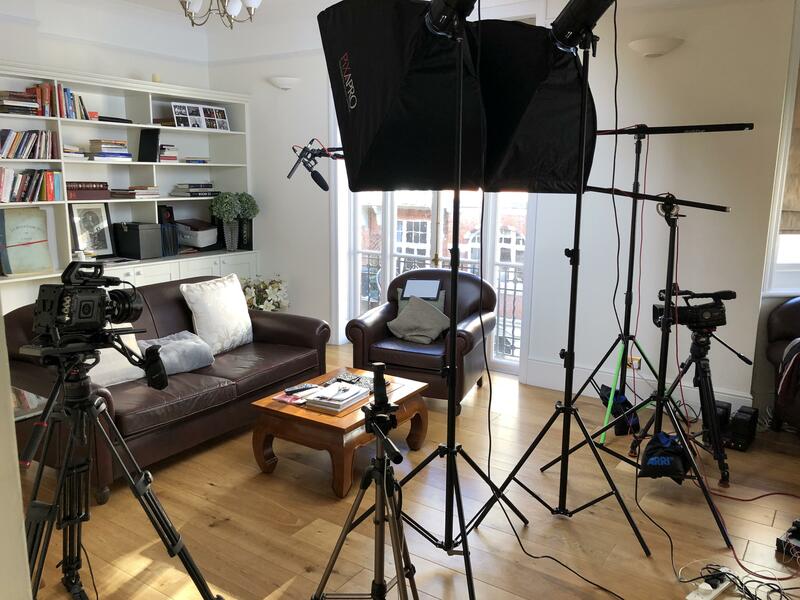 This set up you show would work well for a single to camera presenter. How much lighting and grip equipment do you have? You can make things simple or sophisticated. It comes down to time, budget and location. Thanks for your response Leon. The location isn't always the same but I am trying to have a basic starter set up that I can tweak depending on environment. I have 3 nice LED lights similar to the Aputure 120Ds and a couple of additional lights. 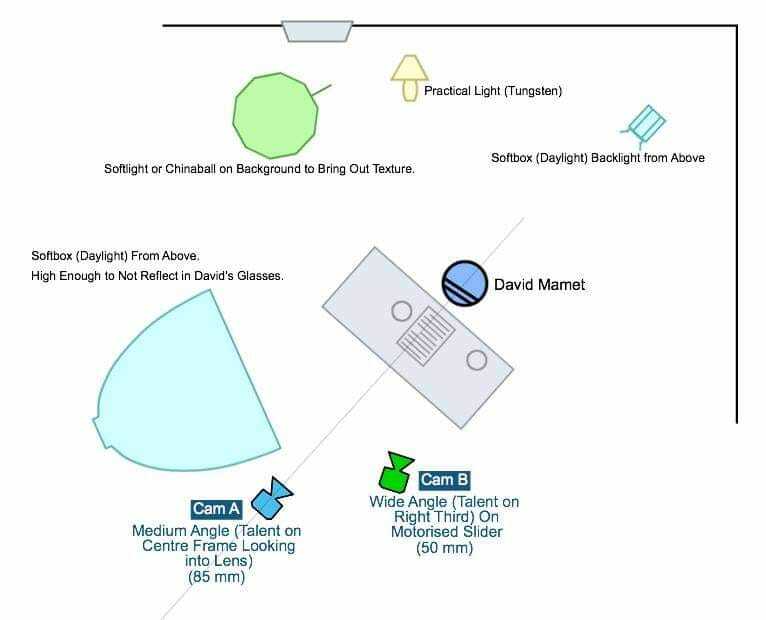 The diagram I provided was sent to me as a guide for creating a look for interviewee only shots similar to the Masterclass series, I was hoping to replicate that look but with both subjects on a wide and a medium shot for each hence the 3 shots. In the above example I have the large window that I have to deal with but other times its different, the below example is shot in my mini-studio where I have more control, there I had cross lighting on the opposite side of the camera and the two people (I am on the left) at a 45 degree angle from each other. It works in this set up because of the darkness hiding my light stands which would be visible in the wide shot if there was any background fill. 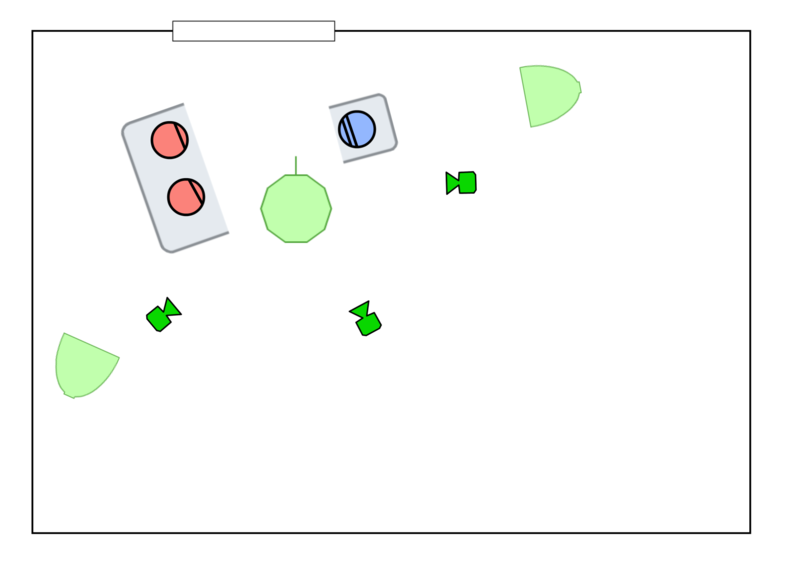 Ie if there was another person on the opposite side of the table (from the first diagram I posted) how would you adjust the set up? So, there are a million ways to address this, but based on what you've said, I think you'd prefer something quick, simple and inexpensive? 2. You need to position the talent such that one does not throw shadow on the other. 3. Both your keylight and your fill or bounce probably needs to be bigger (and maybe more powerful) than if lighting for one. Don't worry, not double, but more. If you put your lights onto a boom stand, the light stand will get out of your frame. Or you can hang the lights down from a Manfrotto Autopole (wall spreader) clamped between two walls. Or you could mount the autopole by using a superclamp onto two light stands and hang your lights onto the pole. You can mount two autopoles vertically (clamp between floor and ceiling) and hang a third pole horizontally onto those two poles. In your example picture you could use a superclamp to mount a backlight onto the book shelves. There are a lot of possibilities you might have not been aware of. Great tips Joe and Robert, thank you. Are you ever interviewing during the day? That’s a small room with light-colored and reflective walls/ceiling. And the background is very appealing. I’d reposition the furniture a little to use the window as your main daylight and something off camera to bounce a little more light on the subjects. If the window is letting in daylight without any direct sunlight, that’s enough light. Otherwise diffuse the window light. You don’t want the window in the frame so that might just work. With all the lights you’re using, you’ve gone unnecessarily dramatic and hidden the beauty of the room. And you can fry an egg with the hot light on top of one of the interviewees. Just controlling the overhead practical may provide sufficient light. If you can’t interview with daylight, ignore this advice! rick.lang wrote: Are you ever interviewing during the day? That’s a small room with light-colored and reflective walls/ceiling. And the background is very appealing. I’d reposition the furniture a little to use the window as your main daylight and something off camera to bounce a little more light on the subjects. If the window is letting in daylight without any direct sunlight, that’s enough light. Otherwise diffuse the window light. You don’t want the window in the frame so that might just work. It is almost exclusively during daylight (although UK winter the hours are short) but I had difficulty using the window as key for both subjects without having their mid-close shots have boring or crappy background. I have to say it came off a tad gloomy without the lights but maybe I didn't arrange things right. Just a thought, but I do feel it might work and adding a few plants and working an angle to include that painting in some way might help the appeal of the room. When it’s available, I like using available light with some help as it looks more relaxing. Listening to the interview, a softer and homey approach may work well. I never feel comfortable giving advice or critiquing someone else's work because I do not know what limitations they are working under. Can you get the cameras for single shot closer to their shoulders? They seem to look way off camera on singles. If you imagine an interview with single subject you try to get the interviewer as close to the side of lens as possible without them sneaking into shot. The same situation should be created with 2 person interview. The eye line should be just off camera. The camera angle should be as close as possible without getting into other camera's shot. I would suggest a fill from the direction of center 2 shot camera, but that will light up your background. If you are locked into the dark, black background and you have the budget and time, I would suggest pipe and drape- black drapes. Are your key lights also working as your backlights? If yes, you need to use net flags to take them down in intensity where the lights hit the heads and shoulders. For talent with no hair use a silk flag. If possible it is more efficient to have the keys as keys only and to have separate small units as backlights. These can be dimmed to taste. These suggestions are limited to you having access to grip gear. MScDre wrote: Ie if there was another person on the opposite side of the table (from the first diagram I posted) how would you adjust the set up? How important is the background? From your question I get that there is a person on either side of the desk, talk show style. The formula stays the same. If you choose to be creative, altering the formula is your call. What you do to one talent, you copy paste to the other. Choose your centre line and work with it. A china ball or a spacelight on a mini boom (on a c-stand) extended between the two people could be nice as a key. It would provide a nice soft light hitting both subjects from the same distance and keep the stand out of the shot. If your light has a bowens S mount like the aputure lights, Aputure also sells an inexpensive spacelight diffuser attachment that could work. Leon Benzakein wrote: I never feel comfortable giving advice or critiquing someone else's work because I do not know what limitations they are working under. The Charlie Rose look is pretty much what I was aiming for in my little studio, but most the time I will have an unpredictable location dropped on me like that living room. In those cases I was hoping to have a starting point formula for best practice. I found that when I simply mirrored the set up in the first diagram things got weird and everything seemed in everything's way. I like the Chinaball idea Tristan put forward it goes with a friend s advice to light the whole scene with 3 point lighting rather than trying to light each person independently. Is there a standard software to draw diagrams like the one I posted in the first message? Be careful not to let this become an obsession. Once you get caught in a spiral you can lose your train of thought it it can become a problem rather than an adventure. China balls are wonderful to use as long as you are able to control the light. You will be lighting 360 degrees. I find that using software for writing/drawing plots is great but you can start by just sitting down with pencil and paper. Formulate a key of the instruments you are using. There are plastic stencils that you can purchase. Most people with lighting experience can read plots written on napkins soaked with beer. As stated before in this thread there are many ways to do this. I have worked on press junkets and as you walk past the various hotel rooms you can see the different lighting set ups that people use. It all ends up on the same framed screen. Take your time to discover what works for you and your situation. Can you direct me to any edited video of these setups. I would like to see how it turned out in camera. I appreciate the simple grip gear they used to flag light. Put the softboxes above eye level on c-stands, and the softboxes act simultaneously as a key for one subject and a backlight for the other. If you're in a small space with light walls, the walls act as a bounce on the back side of the talent's face. If you're in a dark space, I'd boom a china ball above and behind the subjects for a fill light. What software did you use to create your plot? It's called "Shot Designer" - I have it on my iPad, and I know there are other versions, but I don't know exactly what other OSs it is for. It's great! You can build floorplans, plan lighting, and even animate movements. Leon Benzakein wrote: Hi Peter: Can you direct me to any edited video of these setups. I would like to see how it turned out in camera. I appreciate the simple grip gear they used to flag light. These locally broadcast shows are from several years ago. I operated the camera on the left, capturing close-ups of the interviewer. As shown in my previous post, a china ball is the key light, positioned above the prop HDTV. The resulting lighting is flatter than I prefer -- too much fill on their faces from a softlight over the coffee table -- but this was the client's preference. Note: The back side of the china ball was draped with black cloth to prevent spill onto the set walls. For video/TV that image looks good. The china ball is a good solution in this application. I worked on a show as lighting/grip where we used 2 roving china balls. A 400 w and a 200 w Joker HMI on light light stands. We had the ballasts hanging off our shoulders. The talent/carpenters moved all over the room. Since it was a renovating show there was no problem with seeing stingers on the floor. We could dance around the room with the 2 cameramen and just stand in place when need be and shoot 360. The china ball set up worked well. I wondered how well that application would work in an interview setup. Thanks for posting, I see that it is a workable solution. I have not had a chance to work with it much. What was the instrument set up you had? If you have the room, don’t be afraid to move the furniture around. Something like pulling everything forward some to get the couch off the wall and moving the chair so that it’s not directly behind the window. TristanC wrote: If you have the room, don’t be afraid to move the furniture around. Something like pulling everything forward some to get the couch off the wall and moving the chair so that it’s not directly behind the window. I’ve been thinking about that but it would leave the host of the show with a plain white wall as background and I haven’t figured out how to solve that. You could use an RGB-LED or light with a color gel to create an interesting background behind the host. Or you could still keep a portion of the window in the frame to break up the background, just not have it be the entire background behind the host.